Planning a wedding is an exciting time and you can trust The Foursome to make sure your wedding day tuxedos come off without a hitch! Our clothing professionals will guide you through the process, make sure your entire wedding party gets taken care of, and handle any last minute details that may arise. Our on-site tailors are available to make any last minute alterations and we have been known to deliver an extra bow tie to the church just in time for pictures. 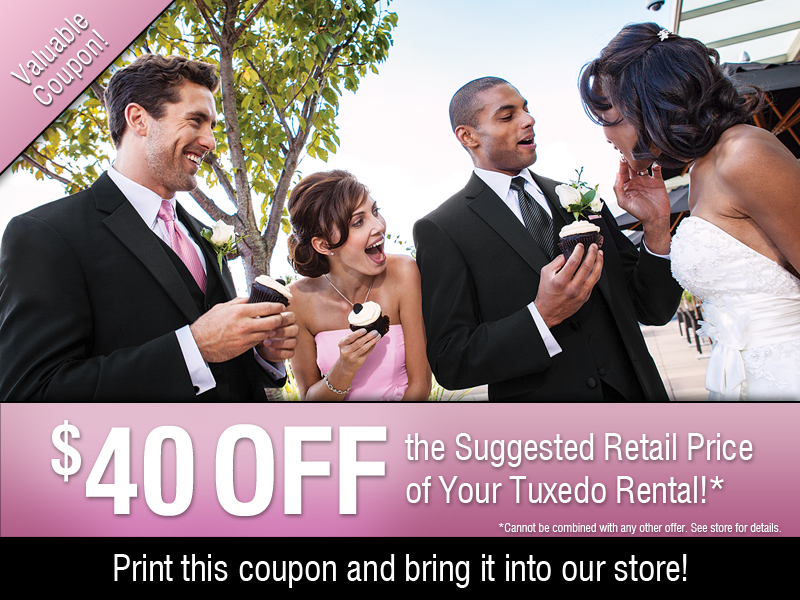 $40 off the suggested retail price of your tuxedos with this coupon. With 5 Paid Rentals: Free groom's tuxedo OR take an Extra 10% off the entire wedding party. With 10 Paid Rentals: Free groom's tuxedo AND take an Extra 10% off the entire wedding party.